Away from the limelight of Europe’s political arena, the fate of a country is being decided this weekend. If it sounds dramatic, it’s because it is. Macedonians are voting in a referendum on Sunday to decide whether to support a deal on a new name between their country and Greece, hammered out between reform-minded Prime Minister Zoran Zaev and his Greek counterpart Alexis Tsipras. If the result supports the name change to Republic of Northern Macedonia (a definite improvement on the unwieldy Former Yugoslav Republic of Macedonia/FYROM), the doors will open, as if by a miracle, for it to waltz into NATO at its next summit and to open EU membership negotiations. Conversely, if the deal falls through, no one – literally no one – has any idea what to do next. 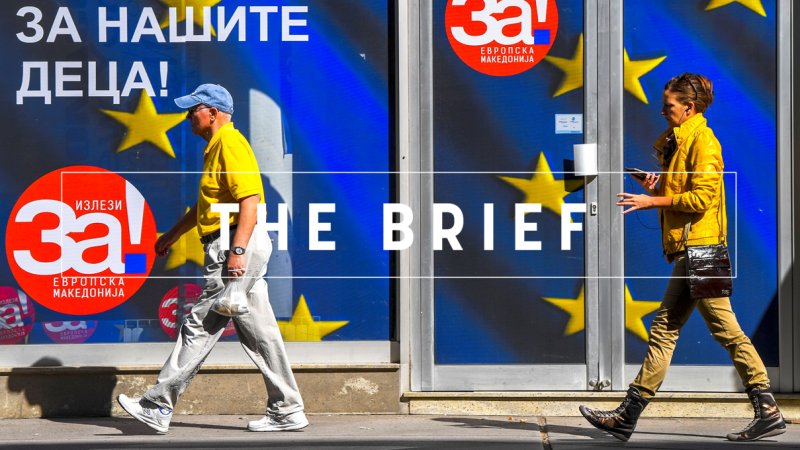 There is no Plan B. FYROM may wait another decade or two, risking stagnation, popular revolt or even a renewal of ethnic tensions, so deeply ingrained in the Western Balkans. It is worth noting, however, that conservative opposition parties in both countries – both members of the European People’s Party – oppose the deal, for reasons that are not entirely clear. Before Tsipras and Zaev, both had been in power in Macedonia/Greece for years but talks on a possible name made no progress whatsoever. So, a lot is at stake. The name issue is very sensitive in both countries. Many, if not most, Macedonians feel they have been unjustly held back by Greece, its more powerful neighbour and already an EU and NATO member. But let there be no mistake: it is just as emotional in Greece, whose northern residents feel they have been cheated by Macedonians who brazenly took their own name for their country. Macedonia, in case you didn’t know, is a geographical and historic region in Greece. The fact that Zaev’s conservative, nationalist predecessors played up the ‘historic Macedonia’ theme, named Skopje airport after Alexander the Great and erected monuments of Greek heroes in the capital did not help. Are you in favour of the European Union and NATO membership by accepting the agreement between the Republic of Macedonia and the Republic of Greece? EU politicians in Brussels are praying for a Yes outcome. The authorities in Skopje, looking for any safeguards they can find, have said they would deem the referendum result acceptable if there is a low turnout, possibly around 40%. So, spare a thought for Macedonia and at least check the referendum result on Monday. En Marche hit the campaign trail against the “enemies of Europe”, reflecting on a consultation about Europe involving 71,000 French people held in the spring. Some Central and Eastern European leaders are concerned that France and Germany are setting the Brexit agenda and might push for ‘no deal’, says the head of the ECR group. The EU’s Master of Brexit negotiations on the other hand decided he might not enter the Spitzenkandidaten race – because Brexit talks might not be over yet by May 2019…? ‘Come back to politics? Maybe in my next life,’ said former Eurogroup president and Dutch Finance minister Jeroen Dijsselbloem and ruled out a return as a member of the progressive platform set up by Macron. Socialists and liberals are crying wolf about centre-right Hungarian PM Viktor Orbán because they want to cover up problems in their own political families, according to an EPP source. The EU slammed Italy’s populist leaders following their defiant pledge to increase spending and run a budget deficit that risks putting Rome on a collision course with Brussels. Closer ties to the West are the most effective tool to counter jihadism and Islamic radicalisation in the Western Balkans. Nevertheless, concerns about returning foreign terrorist fighters remain. Member states started thinking big on tech as they fear falling behind China and the US and plan to develop high-performance supercomputers. Take a look at Tweets of the Week on your commute home this evening. Sunday’s referendum to settle the name dispute between Athens and Skopje. Macedonia announced it will accept the referendum as valid even with low turnout.